Greetings from the Cleaveland airport, I’m on my way back to Yale from California. This past week I’ve been attending y the First Kepler Science Conference at NASA Ames Research Center in Moffett Field, California. It has been a full week of talks and posters on extrasolar planets, planet formation, and stellar astrophysics with emphasis on results from Kepler. I gave a talk in the Kepler mission and exoplanet statistics session presenting Planet Hunters and our first results. My talk and the entire conference was recorded and the videos are available to view here. There were lots of interesting talks highlighting what a treasure trove the Kepler data set is. The Kepler team announced the detection of over 2,000 planet candidates identified in the first five quarters of Kepler observations and the discovery of Kepler’s first confirmed planet (Kepler 22-b) orbiting in the habitable zone of a solar-type star. The habitable zone has been dubbed the goldilocks zone because it’s the region around the star where it not too hot and not too cold for liquid water to exist. So if Kepler-22b is rocky it might have liquid water on its surface, but we don’t currently have a good mass estimate for Kepler-22b so we don’t know what its composition is. Kepler-22 b is bigger than the Earth, with a radius of 2.4 times the radius of the Earth. It orbits its star every 290 days, so the Kepler team has just been able to see three complete transits of the planet.Kepler 22-b was called the Kepler team’s “Christmas Planet” says Kepler principal investigator (PI) Bill Borucki because one of the transits occurred near Christmas. You can find out more about Kepler-22b here and view the light curve here. In other exciting new, lots more data and possible planets are coming our way in the next year. The new public release schedule for Kepler data was presented on the first day of the conference. Quarters 4, 5, and 6 (spanning observations fromDec 2009-Sep 2010) will be released on Jan 7, 2012. Quarters 7, 8, and 9 (Sep 2010-Jun 2011) will be released on Jul 28, 2012. Quarters 10, 11, 12, and 13 (Jun 2011-Jun 2012) will be released on Oct 28, 2012. There’s bound to be interesting and new things waiting to found as we add and more. Past the nominal misson, if the mission is renewed, the Kepler data will no longer have a proprietary period. If NASA awards funding for an extended mission, then beyond November the Kepler light curves will be made available to public as soon as the raw data is downloaded from the spacecraft and processed through the Kepler data processing pipelines. This is going to be an exciting prospect for the exoplanet community and for Planet Hunters. 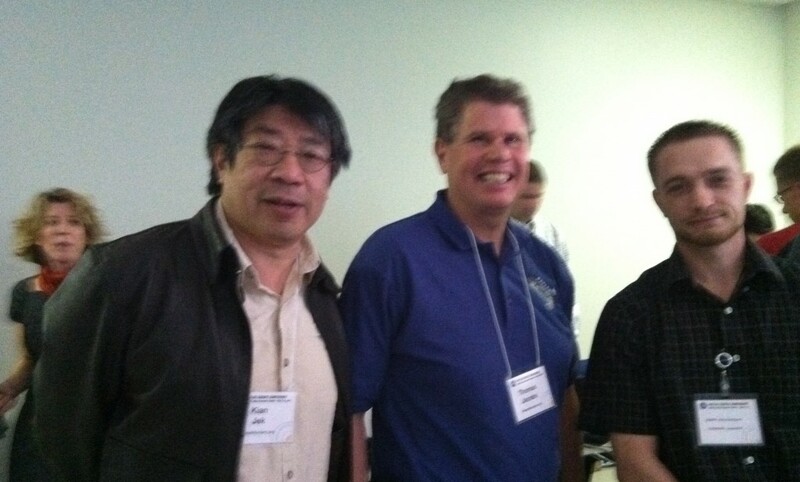 Fellow zooites and Planet Hunters Daryll (nighthawk_black), Kian (kianjin), and Tom(Tom128) attended the conference too. They’ll each be guest bloggers in the up coming weeks to share their impressions and highlights of the conference. That’s a bundle of good news! Nice to see the citizen scientists were well represented, too. There should be lots to do in the years to come.